Today more than ever apparel brands must think of clever ways to disrupt the retail and fashion industries. INSPR is a high-quality apparel designer focused on just that. It’s no secret retailers are struggling to attract and engage consumers in a relevant and digital way. With the use of social influencers and QR codes, INSPR has taken a fresh approach towards creating a meaningful and direct relationship with their consumers. Nowadays everyone has smartphones, and these smartphones have the capability to do almost anything. Smartphone cameras have grown more advanced and now have built-in QR code scanning capabilities. By integrating fashion, social media and QR codes the company has been able to grow its audience base in three short months—building a solid foundation of active consumer engagement and story sharing. A recent study revealed 82% of smartphone users consult their phone before making in-store purchases. The incorporation of QR codes on a hangtag makes it much simpler for consumers to research the item they are buying. If a consumer picks up a dress they adore and scans the QR code it could deliver additional brand outfits, accessory ideas and the story behind the brand. The ease of additional information access and seeing outfit ideas helps to inspire the consumer to make a purchasing decision. In addition to influencing purchase decisions, QR codes enable a direct conversation between the brand and the consumer. Brands create their clothing and ship them out to different retailers for selling. The hangtag coupled with the brand supplied QR code allows the brand the ability to connect with the consumer—regardless of where consumers are purchasing the products. As a brand it is important to separate yourself from your competition, and QR codes are an excellent way to do so through story-telling. Narrate your brand’s history or share the inspiration behind the design that brings the style-story to life. There has been an increasing demand driving consumer decision making fixated on sustainability and manufacturing methods. Purchasing decisions have shifted towards a triple bottom line structure with an emphasis on environmental and social measures. Decision making drivers include knowing exactly where their materials are sourced from as well as ethical labor practice. QR codes offer brands the ability to fully share their story and their core values through transparency and traceability. Beyond production and fair manufacturing practices QR codes provide brands to digitally connect with latest fashion line releases and upcoming promotions. Fashion has become driven by influencers on social media. Influencer marketing goes beyond brand awareness, it cycles through engagement, action and creates a long-lasting relationship with the consumer. 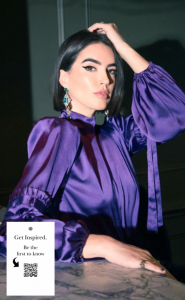 Influencers drive trends and discovery of what’s hip and desirable, creating the must-have pieces as fashion magazines used to do. Social influencer success is dependent on its fan base of social media followers, likes, comments and click throughs. QR codes enable brands to gather more followers, and more followers mean more brand ambassadors and more sales. One QR code offers limitless possibilities, giving brands the opportunity to get creative. Dynamic QR codes can offer different content upon each scan from a single consumer. For instance, the first scan from a unique consumer leads to a landing page that starts the foundation of the relationship between the brand and the consumer. The second scan from that same consumer can go multiple ways. It can showcase an upcoming promotion or offer an incentive to purchase another product. Brands can even share clips of behind the scenes of the inspiration behind the design or a visit to the manufacturing plant. Again, the possibilities are endless. If you’re a brand and are ready to disrupt the norms of retail, we are here to help. Scanbuy specializes in consumer engagement, by helping brands connect with consumers at any time. Reach us today at info@scanbuy.com!